Good things come to those who wait (and “wait” is what Matt Groening fans have been doing for almost two years), and now that patience is being rewarded. 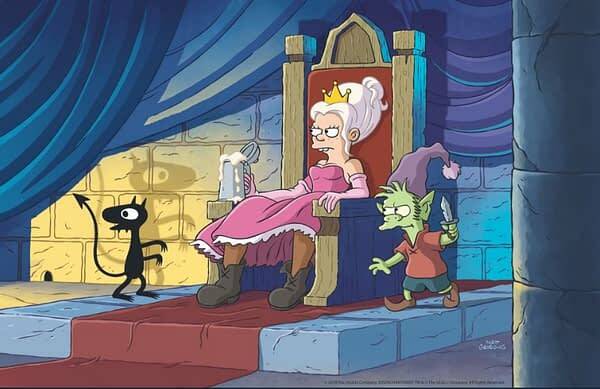 Netflix took to Twitter on Wednesday to offer viewers their first look at The Simpsons creator’s upcoming adult animated series Disenchantment. Given a two-season, 20-episode order, the show’s 10-episode first season is set to premiere on August 17th; with The ULULU Company producing for Netflix, and Groening and Josh Weinstein (The Simpsons, Futurama) serving as executive producers. 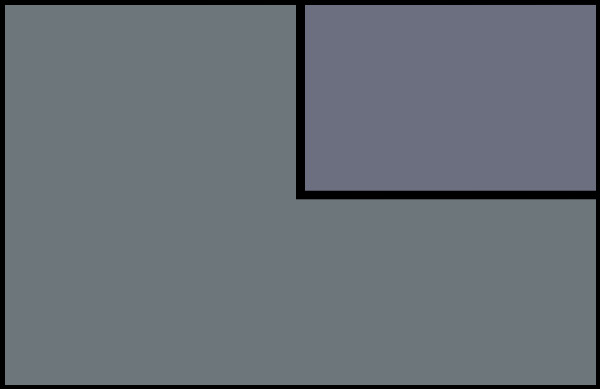 Futurama‘s Rough Draft Studios will serve as the project’s animation house. 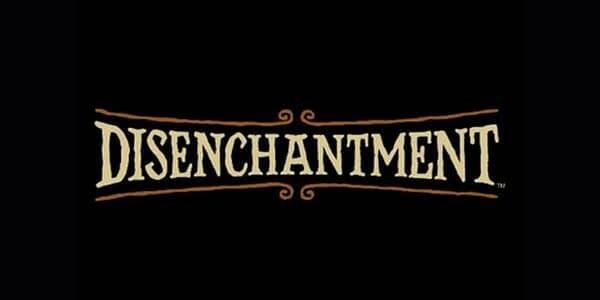 Set in the crumbling medieval kingdom of Dreamland, Disenchantment follows the misadventures of hard-drinking young princess Bean (Abbie Jacobson), her feisty elf companion Elfo (Nat Faxon), and her personal demon Luci (Eric Andre). Along the way, the oddball trio will encounter ogres, sprites, harpies, imps, trolls, walruses, and lots of human fools. 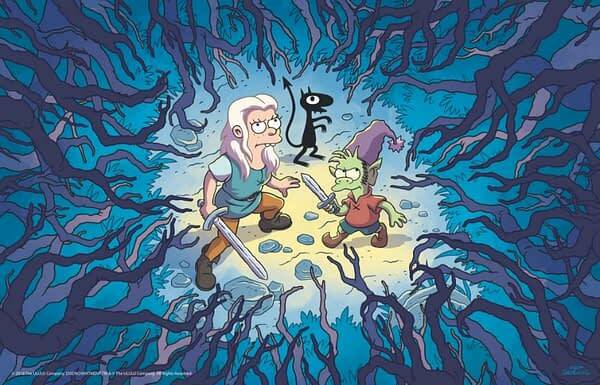 The voice cast for Disenchantment also includes John DiMaggio, Billy West, Maurice LaMarche, Tress MacNeille, David Herman, Matt Berry, Jeny Batten, Rich Fulcher, Noel Fielding and Lucy Montgomery. “We always try to surprise ourselves and then hope we surprise the audience. After doing so many episodes, those surprises become harder to think up. I’m very proud of some of the places the show has gone in recent years, including giving the couch-gag spot to outside animators (including Banksy, Bill Plympton, Don Hertzfeldt and this year’s Oscar winner for best director, Guillermo del Toro).